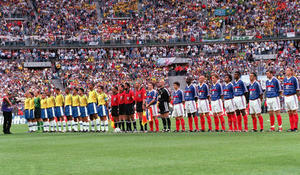 1998 World Cup Final. St. Denis, France. 12th July, 1998. France 3 v Brazil 0. The two teams line up with officials before the match . | フットボール症候群発令!! 1998 World Cup Final. St. Denis, France. 12th July, 1998. France 3 v Brazil 0. The two teams line up with officials before the match .